Environmental Management | Development, Production and Sales of touch panels | SHOEI CO., LTD. Considering the environment is an important responsibility we have with respect to future generations. 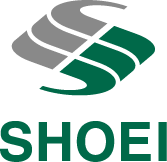 SHOEI recognizes the importance of doing business while seeking harmony with the international community as well as local communities, and has pursued a number of environmental management initiatives as a company-wide endeavor since its founding. 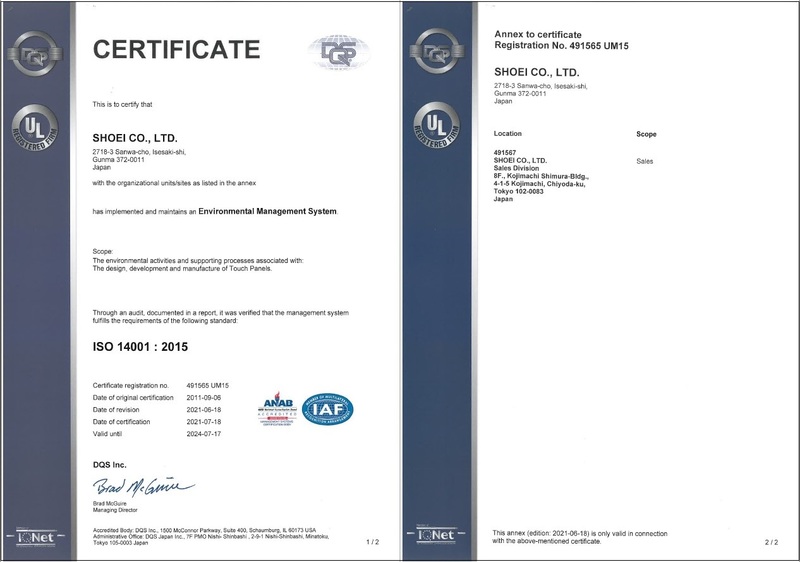 In 2004, SHOEI obtained ISO14001 certification and has made every effort to maintain and improve the quality of its environmental management activities. We consider the environment in every aspect of management, from production and procurement to sales and finance, and are always mindful of the environment and energy conservation in our daily business activities. SHOEI recognizes that preservation of the environment is one of the most important worldwide issues and a foundation of corporate management. In accordance with its management policy of “Contribution to the society through MONOZUKURI,” SHOEI considers and acts in the interests of a healthy environment in every aspect of its corporate activities. With this in mind, we pledge to keep the following points in mind as we engage in business, seek harmony with the global environment, and maintain an unshakeable trust from local residents and all our stakeholders. We will assess the environmental impact of our business activities in the design, development, and manufacturing of touch panels, set and revise environmental goals and targets regarding important items to the furthest extent that is technically and economically possible, and make continual efforts to lessen the burden we place on the environment. By contributing to the society through MONOZUKURI and continually mitigating the major effects the company has on the environment in all of its business activities, SHOEI will take the following actions to integrate with a green global environment and continue to be a business operator that enjoys the trust of its stakeholders. We will conduct studies and assessments on our environmental impact, and in order to effectively reduce or eliminate the main factors of such, we will set management objectives on environmental goals and targets to be met to the extent that is technically and economically possible. We will formulate and implement plans to this end, evaluate the results and make revisions, and make continual improvements to our environmental management system, including pollution prevention activities, leading to the further improvement of our goals and targets. We will adhere to laws, ordinances, regulations, treaties, conventions, and other agreements related to the environment. We will provide the necessary education and training to employees to cultivate human resources who possess strong awareness of environmental conservation practices and can act appropriately in this regard. We will promote clean-up activities and the 5 S’s (Sort, Set in Order, Shine, Standardize, and Sustain) inside and outside our plant facilities. We will promote energy conservation.